Does God’s Word Relate to Today? The Bible is old. Really old. Scholars estimate that the Bible is between 3,000 and 2,500 years old, give or take a bit. Some of the references are so old we don’t even know what they’re referring to. For example, we don’t know what some precious stones referenced in the Old Testament are in modern names. Some of the cultures that played roles in the stories of the Bible no longer exist; in a few cases, didn’t even leave a trace behind. Knowing the Bible is that old, it can feel so distant or irrelevant at times. What did these ancient authors know about how it is to live in these modern, technology-driven times? The first thing to realize about the Bible is that it isn’t meant to be a history book. The Bible is meant to highlight the transformation of people, both individuals and cultures, as they learn to trust and live with the Lord. The Lord is interested in calling His children to Him and the Bible is His guidebook on how we can know Him. God has given us examples of people who have come to know Him and serve Him – not for the purpose of understanding history, but for the purpose of seeing Him more clearly. As we read through the Bible, it is important to know that God doesn’t change. He is eternal, from everlasting to everlasting, the Bible says (Psalm 90:2). Cultures change and even go away. Languages go extinct; languages change over time. But God, the one that the Bible is about and by, doesn’t change. Today, His business is salvation just as it was from the moment sin entered the world. There’s an old saying: the only thing that never changes is change itself. People are the best example of this kind of fickleness; they change like the wind. People are people and have been for a very long time – ever since our creation, in fact. It’s easy to start seeing the fickleness in God’s word, but what we’re seeing is the trouble that people cause, not a failure of God’s word. The plan God has for salvation through Jesus and His return were planned from the beginning (John 1:1). The Bible keeps a reminder before us that God knows what He’s doing and has known forever. Life can feel random and purposeless when only looked at through our own personal frame of reference. When we take a step back and remember the long-term purpose of God, we can reconnect with the joy of living and find peace in finding our own place and purpose in life. How Do I Read God’s Word? Before thinking about study plans or anything like that, let’s talk about the mindset that we have coming into reading God’s word. Do you expect to talk to God about what you’re reading, or do you just read what’s on the page and move on? Do you expect to find treasures that will help and support you through the day, or is it just a task to get through? Expecting to get value from reading the Bible will make a huge difference in what you take out of it. The most important part of our approach should involve talking to God about what we’re reading. If we don’t feel like we can be open with Him about it, it can stifle our ability to learn from the passage or hear what He’s teaching us. It might be easy to talk to Him about passages we like or our favorite verses. But, what about passages we don’t like? What about passages we don’t understand? Are we just as likely to go to Him and talk to him about those? One temptation that many of us fall into is the idea that we have to either understand or love every passage that we read. There are passages that I read that I don’t love. There are stories that I wonder about and struggle through. I don’t feel bad about that; I acknowledge it to God and we talk about it. Just because I don’t understand it or like it doesn’t change that it’s scripture and that it’s good for instruction (2 Timothy 3:16). If there’s something I struggle with, I talk to God about it. In some cases, He’s opened my understanding to see what amazing truths there are to apply to my life. Other times, I leave it with a prayer for understanding and trust that His plan for His word is beyond me and good for all of humankind. That’s OK, too. Worse than pretending we understand or that we like a passage is our tendency to ignore what we don’t understand. We quote what we know and stand behind what we understand and we don’t try to include anything other than that. All of God’s word is valuable for us. Yes, all of it. Maybe not in the same way, but we can’t ignore what we don’t understand. Trying to work through difficult passages is important to deepening our relationship with the Lord, no matter how difficult it can feel at times. Reading the scriptures for ourselves is vital. It is so easy to fall into the habit of letting someone else do the work of digging into the scriptures and telling us how it is. There are many amazing teachers and preachers who are very good at this and bring amazing insight into God’s word. We need to be able to have a handle on what the Bible teaches for ourselves. The more you lean on someone else’s insight, the more of a copy of them you become. That may be a good thing in that they are a good starting point, but we are trying to be made into the image of God, not the image of your favorite Bible teacher. Keep the power of the Word of God close by, doing your own reading of it. Talk to God about it and find your own understanding. Then, the insights brought by others’ teaching will confirm, support and build up the understanding God is working in your heart. The Bible is the defining handbook of Christianity. Others may say that they are Christians without believing the Bible, but that is a strange argument. If you don’t agree with the foundational ideas of the book, why do you claim affiliation with it? For many, not all, but many, it’s so they can find all the good and beneficial things and ignore anything they don’t like or find offensive. That’s not really believing the Bible, though. That’s believing yourself and collecting things which agree with you, including a few things from the Bible. It can be difficult to believe in the Bible, especially in today’s doubt filled days. Breaking that question down, it consists of two things: is it from God and should we live by it? The first question is really one of faith. You can use evidence from archaeology or study the prophecies, or any other intellectual pursuit to try to parse out the book. However, in the end, it all boils down to one question, a faith question: Do you believe this book is God’s guidance to us? You have to choose whether or not you think it’s a divinely inspired book of writing or a trumped up book of history. The second part of the question is whether or not you believe that the Bible should influence you. It’s good to know if you believe it’s from God, but that’s only half the equation. The next piece is are you willing to change based on what you read there? If not, what have you gained by reading it? You may have more understanding about history or religions as a result, but have you changed as a person? If not, then how is that different than any other historical book? I would challenge you that authentic Christianity that pursues the truth of God must be changed by the Bible. If you are the same person today that you were before you started studying the Bible, then I would question the depth of your walk, or, if nothing else, the level of understanding. That may sound harsh, but the Bible claims to have life-altering powers if you connect with God. That’s a powerful statement. If you have read the Bible and say that nothing life-altering happened from it, I return with this: Did you believe it to be the divine word of God, or did you just curiously look at what it said? Take this situation to God and ask Him about it. Expect that He will teach you about His word and how to live it. God is there and real and will help teach you about His Word and its truth. Sometimes the scriptures are so comforting and uplifting. Sometimes, however, that comforting and uplifting is wrapped up in a warning that is unsettling. Several verses in Isaiah 50 and 51 are full of this blended warning and comforting. Having these given at the same time gives us a huge advantage in dealing with troubles when they come. There’s as a seeming contradiction here around shame. First, Isaiah says not only was he beaten, but his beard was plucked, he was disgraced and spit on. The beating, disgracing and spitting would be bad enough, but the beard plucking out is also culturally significant as men in Judaism wore beards. In other words, he was shamed. Or, more specifically, others tried to shame him. Yet here is Isaiah’s response, “The Lord God helps me, therefore I have not been disgraced.” Others have done everything in their power to bring him down, but he chooses to not be dragged down. In fact, he says, “… I have set my face like a flint, and I know that I shall not be put to shame.” He is absolutely determined not to be ashamed. I don’t know about you, but I think that if I were in his place, it would be very hard to choose not to be ashamed. Someone spitting on me and beating me would bring a whole pile of temptation to hide my face and give up. In order to stand with Isaiah in this same way, we need to redefine our definition of shame to line up with God’s definition. Shame is a deep emotion that can affect both immediate actions and long-term ones. Brene Brown, author and researcher on shame and vulnerability, defines shame as the sense of being unworthy. Immediate shame can turn into long-term shame where, for the rest of our lives, we never truly accept that we’re worthy. It can be worthy of respect or love or gifts, or many other things. Whatever it is, our beliefs keep us from accepting what’s being given to us. We feel unworthy because of who we think we are. The comfort in this passage is that God is reassuring us that we will always be worthy in His eyes, no matter what any person on this earth can do to us. God will never push us away. Chapter 51 verses 8 and 9 reassure us of this. 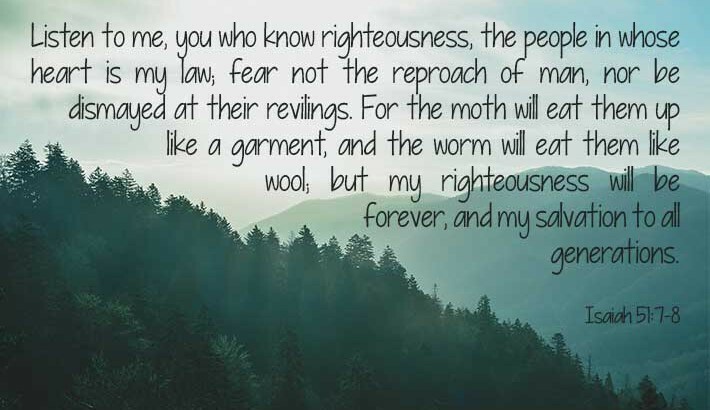 It is to the people who know righteousness and who have God’s law in their heart. We are told that we don’t need to worry about other’s telling us we’re not good enough. Here’s why: God’s salvation, His willingness to extend grace and mercy and love to his children is for all people for all time. The wicked and their views and their definitions of who’s in the cool club, all that will fade away, but God never will. Verse 8 in chapter 50 goes on to say, “He who vindicates me is near. Who will contend with me? Let us stand up together. Who is my adversary? Let him come near to me.” It’s like Isaiah is saying, “You aren’t the boss of me! Only God is!” Isaiah knows whose opinion matters and he isn’t swayed by others even when they beat and embarrass him. Isaiah also knows that God is with him, “He who vindicates me is near.” Isaiah understands that God is a loving Father who helps His children, even though Isaiah was physically hurt and mentally abused. Nothing swayed his belief in God or his understanding of his worth in God’s eyes. I pray that we can begin to understand God on this level as well. When we have built up our confidence in who we are in God’s view, strength and confidence will pour out of us and we will be able to step up, and, like Isaiah, proclaim God with all our hearts.